As computers became more prevalent in workspaces and classrooms, doctors began to see an increase of carpal tunnel syndrome. This particular medical issue develops in the wrist. There is a fairly similar problem that can arise in the ankle – tarsal tunnel syndrome. It might not be as common as carpal tunnel syndrome, but painful symptoms still need to be addressed, and we can do that for you here at Richardson Podiatry Associates. The proper starting point for looking at this particular ailment is with a structure found on the inner edge of the ankle known as the tarsal tunnel. This is a narrow space that is covered by a thick ligament (the flexor retinaculum) which functions to protect the structures it contains – tendons, nerves, arteries, and veins. An important nerve is found within the “tunnel”—the posterior tibial nerve, and that is what can lead to this condition. A problem develops when there is squeezing or compression on this posterior tibial nerve—similar to the pinched nerve with carpal tunnel syndrome that occurs in the wrist. In the tarsal tunnel, the source of compression can be several different possibilities, such as varicose veins, ganglion cysts, arthritic bone spurs, and swollen tendons. The results of compression are the same symptoms a pinched nerve anywhere can bring: numbness, tingling, and pain. Some cases develop in response to injury, particularly ones that result in swelling or inflammation in or near the tarsal tunnel. Other times, a systemic disease (like arthritis or diabetes) causes the swelling. Additionally, individuals with flat feet have higher risk due to outward tilting of the heel as a result of the structural abnormality. Ice. For 20 minute intervals, apply an ice pack wrapped in a thin towel to the affected area a couple of times during the day. After an icing session, wait at least 40 minutes until repeating. Rest. 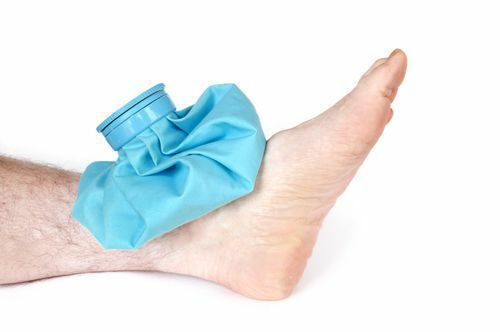 Staying off the affected foot will allow the body to perform its natural healing processes, but this is also essential for preventing further injury. Immobilization. One of the best ways to allow the nerve and surrounding tissue to heal is by restricting the movement of the foot. This can be achieve with the use of a cast or brace. Medication. You can reduce inflammation and pain with the use of nonsteroidal anti-inflammatory drugs (NSAIDs) and we will provide you with appropriate type and dosage recommendations. Injection therapy. In addition to oral medication, many patients benefit from corticosteroids or local anesthetics as a means to treat inflammation in the tarsal tunnel. Physical therapy. Physical therapy modalities, exercises, and ultrasound therapy are sometimes used to reduce painful symptoms. Shoes. We will likely recommend supportive shoes to help improve the condition. Orthotic devices or bracing. These can be used to either maintain the foot arch, which will limit the excessive motion that compresses the nerve, or reduce the amount of pressure faced by the affected foot. Tarsal tunnel syndrome is just one of the various ailments that can cause ankle pain, but Richardson Podiatry Associates can help by diagnosing your condition and then providing an effective treatment plan. We provide first-class foot and ankle care for patients from all across the greater Dallas-Fort Worth community, so come in and find out for yourself why they consistently choose us. You can give us a call at (972) 690-5374 and speak to one of our friendly staff members. We’ll be glad to provide additional information, answer any questions you might have, and schedule your appointment. If you’d prefer, you can always schedule your visit at our Richardson, TX office online.